A Prunus domestica L. cultivar. ‘Branches smooth. Leaves with two globular glands at the base. Fruit oval, of the largest size among Plums, about two inches and a half long, and two inches in diameter, deeply marked by the suture, pitted at the point, abruptly tapering and hollowed out at the base for the reception of the stalk. Stalk three quarters of an inch long, slender. Skin greenish yellow, with numerous rich spots of bright violet red next the sun. Flesh greenish yellow, adhering firmly to the stone. Juice very sweet and delicious. Stone sharp-pointed. Ripe the end of September, and will hang some time upon the tree after it is matured. This will keep for a considerable length of time, after it is gathered, either by suspending it by the stalk upon a string, withinside a window facing the sun, or by wrapping it in soft paper, and keeping it in a dry room. By this latter method, I have eaten it exceedingly good in October, twelve months after it had been gathered.’ [George Lindley – Orchard Guide p.462/1831]. There are somewhat conflicting opinions of its origin. ‘Of all the Plums of any modern origin, this and the Washington [which see], already figured in this work, are not only by far the best, but perhaps superior to any of the oldest varieties. This was raised by a gardener of the name of Coe, at Bury St. Edmunds, in Suffolk, about twenty years since; but from the stone of what variety is not known. It is very handsome, ripens about the end of September, and will shrivel and keep in a good state for more than a month later; indeed, if properly dried, it will keep as well as the best Imperatrice Plums. It is a great bearer; but should be trained upon a west or east wall to ensure a crop.’ [PM t.57/1829]. ‘It was raised by the late Jervaise Coe, a market gardener at Bury St. Edmund's, in Suffolk, more than thirty years ago. He informed me it was from the stone of a Green Gage, the blossom of which, he supposed, had been fertilised by the White Magnum Bonum, the two trees of which grew nearly in contact with each other in his garden. It requires an east or a west wall; on the former the fruit attains its greatest perfection.’ [George Lindley – Orchard Guide p.462/1831]. ‘This plum is known in some collections, under the name of the Bury Seedling, or Coe’s Seedling; and is said to have been raised from seed by Mr. Coe, at Bury, in Norfolk. In opposition to the statement, that it is a variety of very recent origin, it is asserted, that a tree, of at least fifty years’ growth, was cut down in the garden of Mr. Scholey, at Putney, about five years ago. The specimen from which the annexed Plate was taken, ripened on a west wall, in the Royal Garden at Hampton Court, in September 1813. It may be confidently recommended as superior to any late Plum at present in the British Isles.’ [PL vol.1, pl.14/1818]. This is the illustration used here. ‘Golden Drop is seemingly fit for all purposes to which plums are put for dessert, cooking, canning, preserving and prune-making. For the last named purpose it is unsurpassed for a light colored prune of large size, readily selling at a fancy price in delicatessen stores. The fruit when carefully picked and handled keeps for a month or more, shrivelling somewhat but retaining its flavor and pleasing flesh-characters.’ [Plums of New York p.229]. Also figured in Pomologia Britannica [PB pl.XVIII/1812]. Listed in all published catalogues as ‘Coe’s Golden-drop’ [Plum no.1/1843]. 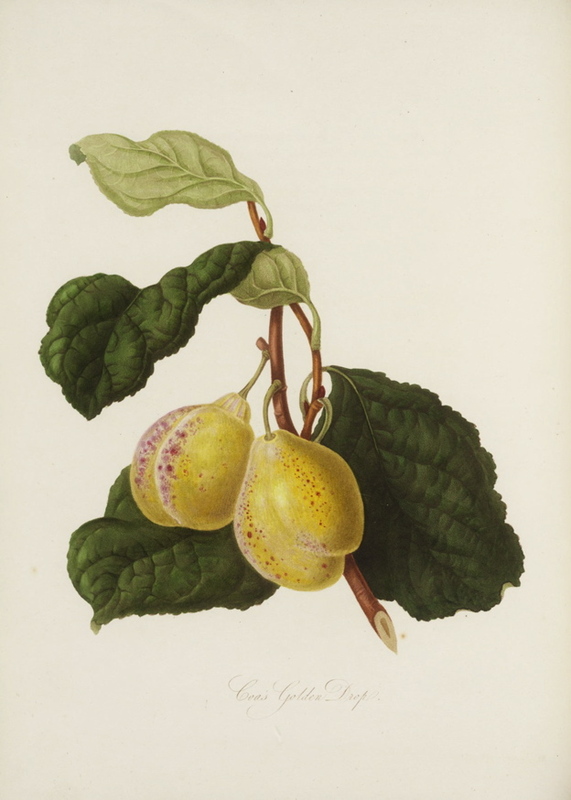 On 24th December 1844 Macarthur wrote to John Bailey of Adelaide on the quality of plums: ‘out of the eight other sorts we cultivate [other than the Greengage] we consider Coe’s Golden Drop to be superior and one or two others to be nearly equal.’ [MP A2933-2, p.25/1844].